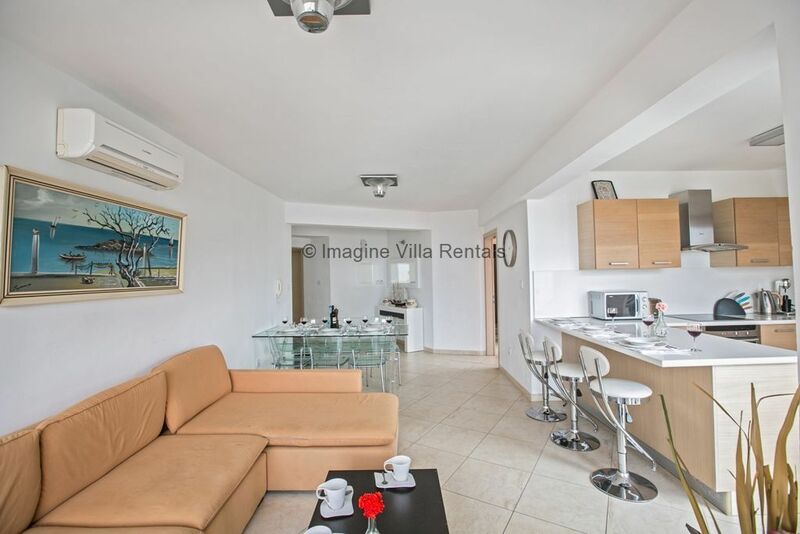 This beautiful 3 bedroom sea front apartment is located in the heart of Protaras on Fig Tree Bay Beach. Within walking distance to all shops, bars and restaurants it is an ideal choice for relaxing beach holidays. With spacious inside and outside areas, the apartment is modern and fully equipped with everything required for a comfortable stay. As you enter the apartment there is an open plan living room, kitchen and dining area. The living room features a widescreen TV with satellite channels, a DVD player and a large corner sofa overlooking the sea views. There is a dining area to seat 6 persons and a fully equipped kitchen with a breakfast bar that seats an extra three persons and a large veranda with seating area that leads off from the kitchen. There are three large bedrooms, including one with an en-suite bathroom. The two bedrooms have double beds, one of them also featuring a veranda with seating area and sea views and the third bedroom has two single beds. You will also find the main family bathroom. Close Beach 10/10 - Facilities 10/10 - Sea Views 10/10 - Imagine Rating 9/10 - Overall 10/10. Pallinio complex is located in Protaras center, just a few meters away from the famous Fig Tree Bay Beach and all other amenities.